Western Cheeseburger Sliders are juicy miniature hamburgers loaded with barbecue sauce, cheese and crispy onion strings! We are big burger lovers here at the Lofthouse residence. My hubby can grill up some mean hamburgers. He always gets praises (especially from me) for his grilling skills. 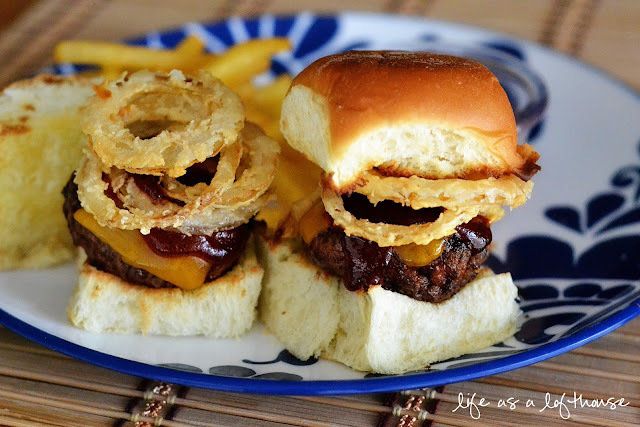 When I was craving a nice, juicy hamburger last week, I decided to make these sliders. Kale was at work all day, so I thought I’d surprise him with some Western Cheeseburger Sliders to come home to! I’ll admit that they were a little time consuming, but totally worth it. The crispy onion strings are what topped these off to perfection. 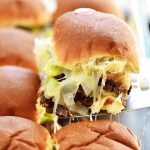 They give these sliders a nice, flavorful crunch! Mmmmm..
We will be making these again and again this summer! Heat a large grill pan or skillet to medium heat. Divide the hamburger meat into 12 equal portions. Shape each portion into an oval patty. Sprinkle each hamburger patty with salt and pepper. Add 2 Tablespoons of butter to heated skillet and let melt. Once butter is melted, add only 4-6 hamburger patties at a time, to ensure even cooking. 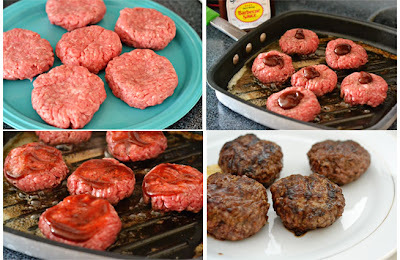 Spread ½ a tablespoon of barbecue sauce over the tops of patties in the skillet. Grill patties on each side for 4-6 minutes. Once you flip to other side, add another ½ tablespoon of barbecue sauce and spread. Continue cooking until no longer pink and cooked through. Place cooked patties on a baking sheet, and keep in a warm oven until all they are all finished cooking. Place one cooked hamburger patty onto the bottom of dinner roll. (I buttered and toasted our dinner rolls first). On top of patty, add one half slice of cheese and more barbecue sauce. Top with crispy onion straws and the top half of dinner roll. Repeat with all others, and serve immediatley. Enjoy! Slice onion into very thin rings. Place in a large bowl and cover with buttermilk. Let soak for atleast an hour. Combine dry ingredients and set aside. Heat oil to 375 degrees. Grab a handful of onions and place into the flour mixture. Tap to shake off excess, and plunge into hot oil. Fry for a few minutes and remove when they are golden brown. 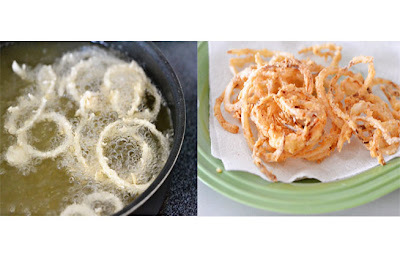 Place fried onion strings on a large platter lined with paper towels to soak up grease. 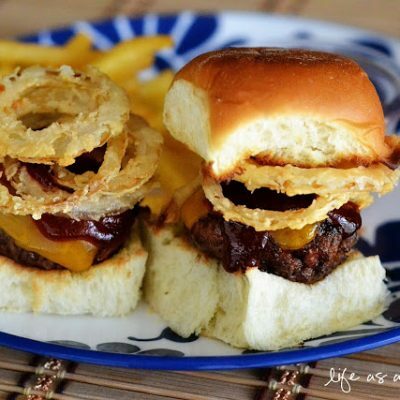 Repeat with remaining onions, then serve on sliders and as a side! I love PW onions strings! Yummers Holly! I’m coming to your house for the next burger night:-) Those look incredible!!! Onion straws on burgers are never a sad thing. YUM!! Ummmm, ummmm!! 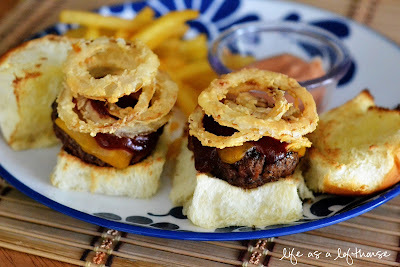 Those burgers look great and I will be trying the onions strings with the sliders! 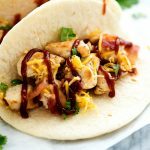 I’m new here and really like your blog! I’ll enjoy following to see what’s next! 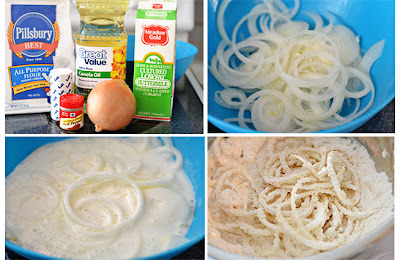 I just made PW’s onion strings on Sunday and they were amazing. Can’t wait to try them on these sliders! Yum! These look so cute and delicious that they’re bookmarked for when my nieces come to visit again. These look like they are definitely worth the time…those onion strings look awesome. 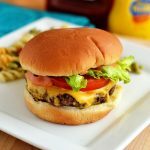 My husband wants hamburgers at least once a week and I kind of get tired of having them so plain – will have to try these.so yummy!